Good people who lived good lives are bad subjects for a family historian trying to create vivid profiles that snap, crackle and pop with individuality. Most of our families come from hardworking, warmhearted and respectable people who kept their names out of the newspapers. So our good folks are boring, unless, maybe, they were good and rich. I’m among those fortunate to have long-ago cousins who did some bad, bad things. This was news from Southeastern Massachusetts to Boston, to New York City where the Tribune ran the story above on September 30, 1856. From that single paragraph, unravels a convoluted and frankly sordid story. For starters, the murdered man, David Simmons Hathaway, and the murdering woman, Adaline (Hathaway) Clark, were cousins, the grandchildren of Dudley and Margaret (Briggs) Hathaway. 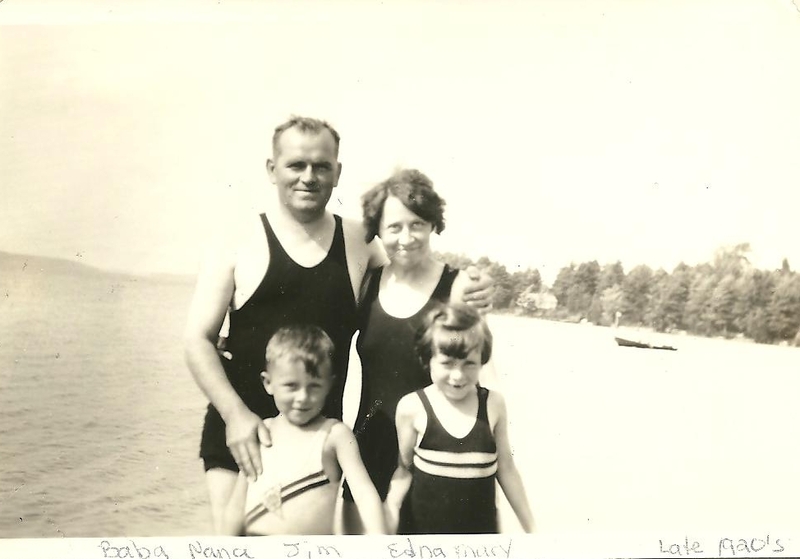 Both families had deep roots in Freetown, Massachusetts. If David senior objected to the union for a reason other than his son’s youth, it’s been lost to time. But I’ll bet David and Olive surprised the community by waiting three, long years. When David reached his majority (21) in 1833, no one could keep him from making Olive his own. The year after, a daughter, Sarah Briggs Hathaway, was born. She was to be the couple’s only child. After the 1840 US census, Olive Hathaway disappears from record. David Hathaway became a man adrift who relied on alcohol to forget his sorrows and assuage his pain. If he was addicted to drink, it’s not hard to understand how David’s character may have taken a dark turn. He may not have been a very good father. In 1848, at 14 1/2 years, Sarah married John Peirce, a man 8 years older than herself. Two years later for the 1850 US census, Sarah and John were living with a Barrows family (probably relatives of her mother). I haven’t yet discovered where David was staying and what he was doing that year. His name resurfaces for the 1855 census in Freetown, and there he spent his last 14 months on Earth. 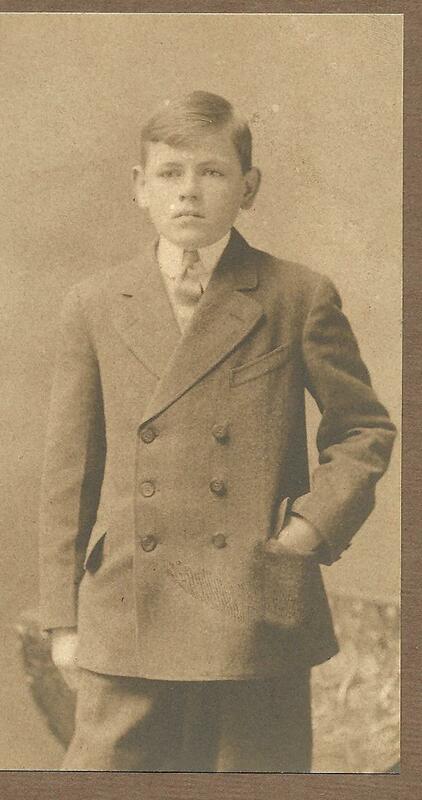 Phillip H -Clark – Age 4. David S. Hathaway – Age 43 – Farmer. Seth has advanced from a laborer to a stone cutter, a skilled trade, which means he’s at last making a better wage. Two sons, Albert (20) and Rhodolphus (15), are missing from the home, and Bradford (17) is out of school and at work himself. David S. Hathaway was knocked down by Mrs. Seth Clark with a billet of wood for licking her son. Adaline had a grievance, and few parents wouldn’t seek to punish an adult who assaulted their child. However, to pick up a piece of lumber and beat a perpetrator to the ground, suggests a helluva temper. For the incident to make the papers as far away as Macon, Georgia, Adaline must have given David a spectacular thrashing. The opening newspaper quote makes the incident seem a clear case of self-defense: David Hathaway came home drunk out of his mind, and an argument ensued that escalated into an axe attack. Adeline Clark saved herself from a grisly fate by making a single, perfect, kill shot. Self-defense was what Adaline told her neighbors that night. Self-defense was what she told the authorities. On examination, Adaline explained she’d gone to bed and was roused sometime later by the noise made by the falling-down-drunk David Hathaway who was attempting to get inside the locked back door. Adeline took an oil lamp to guide her way to the kitchen and let David inside. He took the lamp from her and shoved her outside into the rain. While she pounded and pleaded to be let back in, David guarded the door, axe in hand, and vowed he’d use it if Adaline reentered the house. After an hour and a half outside in her rain-soaked clothes, Adaline said she heard a chair tip over, then a thud which she assumed was David having fallen down. At this point, Adaline went into the house and retrieved the pistol she had bought a week or so before and kept ready. By the lamp light in the front room, she saw David on the floor with the axe beside him. She claimed he reiterated his threat to kill her and “two or more of her children.” However, David was too incapacitated to stand up. That was the moment Adaline chose to fire a bullet into his brain. Somewhere, in the interest of full disclosure, she added that she had been David Hathaway’s mistress. Having given testimony that she believed completely justified her act, Adaline must have been knocked for a loop when the coroner’s jury rendered its verdict of willful and malicious murder. Adaline failed to realize that her own account of the shooting and the advance planning that went into it, were cold and calculating moves. Why didn’t she go to her neighbor’s house when David locked her out in the rain, before she killed him, instead of afterward as she did? In spite of the wilful and malicious murder finding, Adaline was tried at Taunton for the lesser crime of manslaughter. In October 1858, Adaline Hathaway Clark was sentenced to five years at hard labor in the New Bedford House of Correction. At 45 years of age, Adeline was enumerated there among the other inmates for the 1860 US census. Having paid her debt to society, she was released in June 1863. Several newspaper stories about Adaline including the line, She has a husband living in Rhode Island. That’s right, we can’t forget about Seth Clark, head of household, husband and father until his world imploded. When Seth left Freetown we can’t say exactly; why he left is an easy guess in light of Adaline’s publicly confessed adultery. It’s most likely that Adaline and Seth never laid eyes on each other again after 1856. In the 1865 state census, ex-con, Adaline Clark lived again in Freetown with her 26-year-old son, Bradford. She claimed that year she was a widow, but she wasn’t. In 1880 Adeline said she was divorced, but that was not true either. 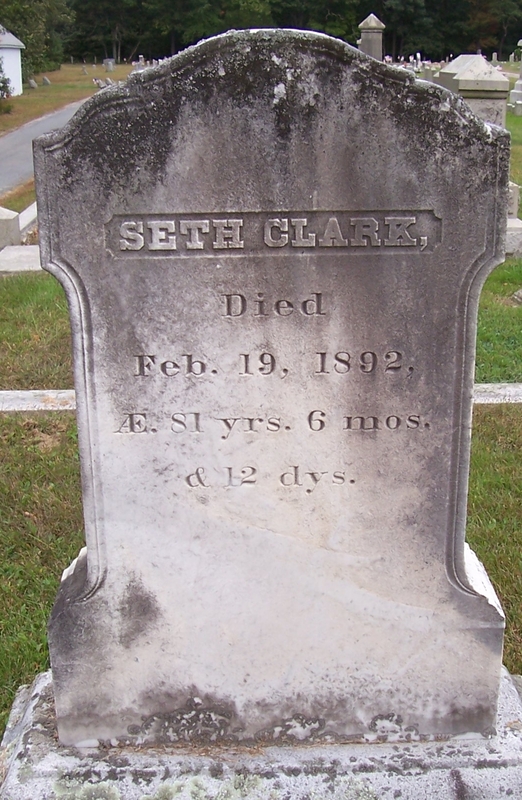 During that same enumeration, Seth Clark, alive and well in Providence, RI, said he was a widower. And so the estranged spouses alternated between wishing their legal bonds dissolved, and wishing the other dead – for the rest of their long lives. 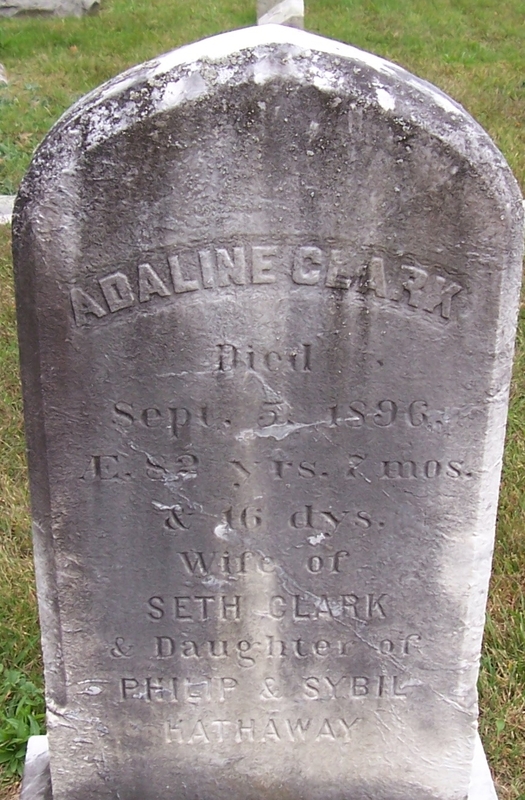 Seth died in 1892 at nearly 82 years, and Adaline went in 1896 at 82 and some months more. It’s touching irony that Seth and Adaline Clark were laid to rest forever together in Assonet Burying Ground. We who know the worst about them should resist the urge to smirk, and consider this. The Clark children suffered instability, a broken home, and social stigma that must have hurt them in countless ways, – and yet they understood that in the end, love is all that matters. The surviving Clark children forgave and honored their parents so that Clark descendants strolling the peaceful yard today might think of Seth and Adaline as just another boring, long-married couple. National Archives (NARA); US Population Schedules. Massachusetts. 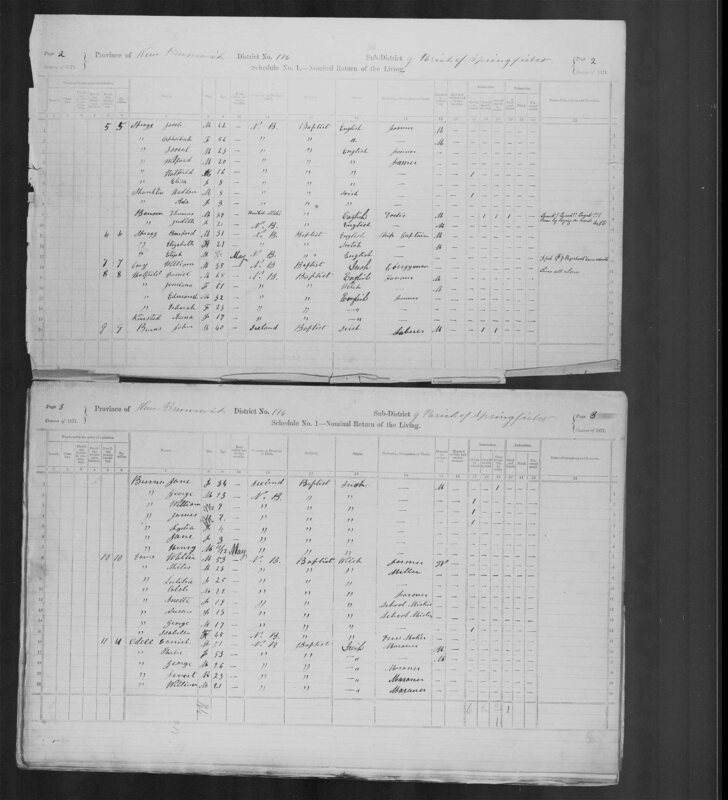 1855–1865 Massachusetts State Census [microform]. New England Historic Genealogical Society, Boston, Massachusetts. Ancestry.com, Massachusetts Town and Vital Records database. In 1657, George Barlow, a stranger to town with two sons and no wife, swore the Oath of Fidelity in Sandwich, Massachusetts. George declared he was free of legal bond, a member of the church (Congregational, of course), that he would defend the colony and vote on local governance issues. Thus, the forty-something single father, George Barlow met the standard for respectability, but his life prior to this moment seems lived off the record. It happened that the term for the current Sandwich constable, William Bassett, was coming to an end. On Bassett’s watch, Boston had disturbing reports that Plymouth Colony folks treated strangers with charity and tolerated differing views on Christianity as matters of conscience. The Puritan masters lived in daily terror of eternal damnation and had documented sightings of Satan. They had reports of Quaker missionaries avoiding Boston for alternative routes into the country, so the government alert level was “code red.” And someone in Boston knew George Barlow was the blunt instrument they needed. On June 1, 1658, the General Court appointed Barlow constable for Sandwich – with a special mandate to harass religious dissenters, – and those who aided them. The constable was tasked with jailing local offenders, administering punishment, and collecting fines and fees. He was also granted certain powers that included conscripting men to assist him. He could also appraise property and choose what goods to take in forfeiture when people had no money. A perk of the office allowed the constable to pocket ten percent of all monies collected. For a bully like George Barlow, was a dream come true. He could torment Quakers – and anyone else he liked, while making a good living for himself, and earning points with Boston. 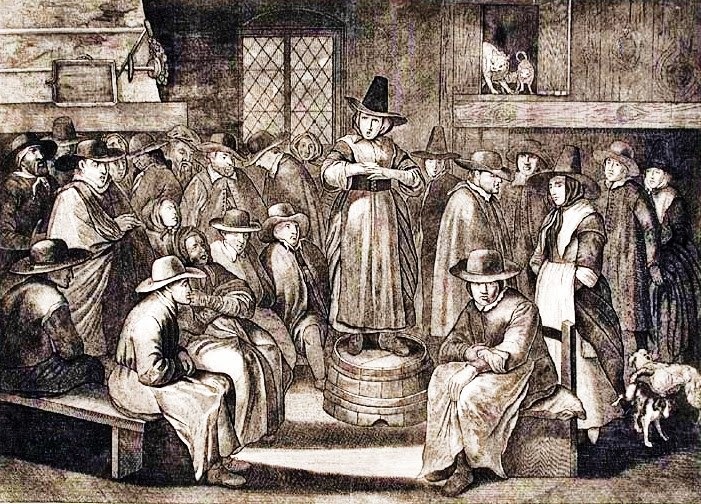 A woman addresses an early meeting of Quakers. Few 17th Century minds could deal with the concept of equality. Knowing their faith forbade them taking oaths (for loyalty belonged to god alone) and to harm others, George targeted Quaker men to conscript as deputies. He knew they must refuse, they wouldn’t fight, and they’d be fined. George impoverished several Sandwich families. From those with no money, George took what would hurt the most, –even to the essentials of living, food, livestock, tools, household goods that included cooking pots. He sent men to prison in Boston, leaving behind women and children to fend off cold, hunger, and likely sexual harassment from…Constable George Barlow. Prominent Sandwich townspeople sympathized with the persecuted Quakers and helped the affected families. 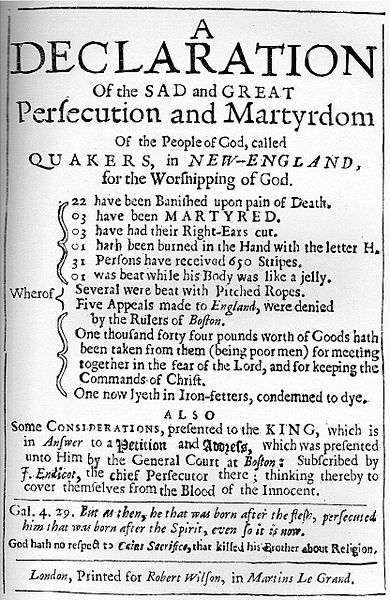 Non-Quakers also refused to serve Barlow as deputies and paid the price. We know of a few men who told George Barlow what they thought of him to his face. However, at this point, Barlow’s career had reached its zenith. A few months after his jurisdiction expanded, George himself was fined 20 shillings by the court for cruelty to… wait for it…a Quaker! George had seized Benjamin Allen and locked him into the stocks at Sandwich overnight – with no legal provocation. He was also cited “for other wronges done by him unto the said Allin.” At the same court session, George was also ordered to return a shirt and other clothing he had taken from Ralph Allen. Additionally, the William Allen family was one of those impoverished, and not because William was a Quaker (at the time), but because he allowed Quakers to hold meetings in his home. George Barlow was less and less able to pass himself off as respectable by any standard. He drank, he picked fights, he disturbed the peace, and he hauled family members into court. After his term in law enforcement ended and with it, his authority over others, George Barlow faded away. There is no record of the day he died. Ironically, the memory of George Barlow remains alive because of the people he victimized. “At a time when William Allen was in prison in Boston, Barlow paid a visit to the Allen home. He took the cow and all the food he could find, including some given to Mrs. Allen by neighbors. Then for good measure he confiscated the only kettle she had, and leered at her triumphantly. “Now, Priscilla, how will thee cook for thy family and friends? Thee has no kettle. Legend has it that Priscilla Allen was right. Dear Readers, I’m surprised myself to announce a Part 3, George Barlow – The Brute and Bully At Home, is yet to come. Title quote from The American Genealogist; Vol. XXVI, No. 4; October, 1950; Barclay, Mrs. John E.; Ann (Besse) Hallet, Step-Mother of Abigail (Hallet) Alden. A few years ago I got an email from cousin John O’Connor who had recently cleared out his elderly mother’s Florida beach house. In the process, he came across an index card that most folks would have tossed away without a thought, and, fortunately, John thought about it. He scrutinized his mother’s faded and cryptic notations and realized he had 3X5 inch version of 19th-century Iowa family history. Image of faded original doctored to make it easier to read. When he emailed me to see what I could make of it, I was intrigued to learn about the Galway trio of Larry Cofflin, Pete and Rohan! But I was frustrated, too. This information failed to resonate with anything I knew about our shared ancestry. John’s forbear was Patrick Roane, the brother of my John P. Roane. Both men married in Lowell, Massachusetts, but while John stayed, Patrick struck out to obtain newly available government land in Iowa. Since my initial confusion, I’m happy to relay, I’ve learned a lot. I discovered more descendants of the Midwest families, and resources that enabled me, at last, to interpret the notes made by John’s mother, Joanne Rowan O’Connor (1931-2013). In 1950, a book came out that was written by Leo Ward, a Monroe County, Iowa native and priest, titled, Concerning Mary Ann. It is a fictionalized account of the life of his grandmother, Mary Ann (Coughlin) Murray (1859-1957), and the Irish Catholic settlement known as Staceyville. Ward wielded elements of history, language and character to evoke a unique time and place, – and tells a good tale with authenticity. However, the first name on the card about Rowan history, is “Larry Cofflin,” who was Mary Ann’s father. Then, though I’ve found documents using Roane, Roan, and Rowan variant spellings, the only place I’ve found “Rohan,” is in Leo Ward’s book. I believe the excerpts below show that the first lines came straight from Concerning Mary Ann. I believe that well researched fiction can inform us about lives and times of our ancestors. However, even if we know real people inspired characters in a book, it is a mistake to accept those accounts as fact, without careful examination. We are lucky today to have online records easily available that help sort truth from fiction. Ward’s book describes bachelors traveling together in 1857, but we have documented that Patrick Roane married in 1853 and came to Iowa with his wife and daughter. But we have strong evidence that Lawrence Coughlin, Patrick Roane and Edward Roane were in league together for on June 3, 1856, each received patents on parcels of abutting land from the Chariton Land office. Census records from 1870 until 1900 show Lawrence Coughlin and Patrick Roan families occupied neighboring farms, but Edward Roane is absent. 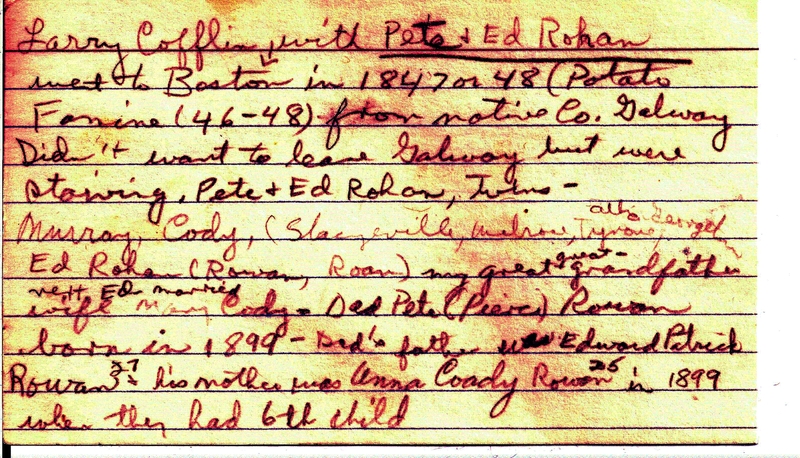 However, it is not surprising that Mary Ann Coughlin remembered the names, “Pete and Ed Rohan.” They belonged to her generation of immigrants’ children. The book describes times she shared with the same-age friend, Rose Anne Roan. She was Patrick’s daughter and had brothers, Peter (1863-1942) and Edward (1868-1928). There was also, a set of twin boys, Edward and Lawrence, born to the younger Edward in 1905. These fellows just happen to be brothers of Pierce “Pete” Rowan, whom Joanne O’Connor identifies as her father. The index card is decoded as part truth and part literary legend, with some mysteries yet to plumb (Were the two Roanes were really twin brothers? What happened to the elder Edward Roane?). And thus did Joanne Rowan O’Connor succeed in passing on a priceless bit of tradition for her children and grandchildren.